Radio masts and towers are, typically, tall structures designed to support antennas for telecommunications and broadcasting, including television. There are two main types: guyed and self-supporting structures. They are among the tallest human-made structures. Masts are often named after the broadcasting organizations that originally built them or currently use them. The terms "mast" and "tower" are often used interchangeably. However, in structural engineering terms, a tower is a self-supporting or cantilevered structure, while a mast is held up by stays or guys. Broadcast engineers in the UK use the same terminology. A mast is a ground-based or rooftop structure that supports antennas at a height where they can satisfactorily send or receive radio waves. Typical masts are of steel lattice or tubular steel construction. Masts themselves play no part in the transmission of mobile telecommunications. Masts (to use the civil engineering terminology) tend to be cheaper to build but require an extended area surrounding them to accommodate the guy wires. Towers are more commonly used in cities where land is in short supply. The Gerbrandy tower consists of a self-supporting tower with a guyed mast on top. The few remaining Blaw-Knox towers do the opposite: they have a guyed lower section surmounted by a freestanding part. Zendstation Smilde, a tall tower with a guyed mast on top with guys which go to ground. Torre de Collserola, a guyed tower with a guyed mast on top where the tower portion is not free-standing. Experimental radio broadcasting began in 1905, and commercial radio broke through in the 1920s. Until August 8, 1991, the Warsaw radio mast was the world's tallest supported structure on land; its collapse left the KVLY/KTHI-TV mast as the tallest. 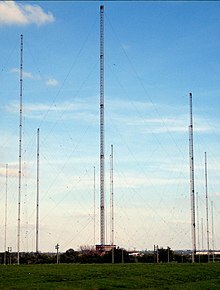 There are over 50 radio structures in the United States that are 600 m (1968.5 ft) or taller. The steel lattice is the most widespread form of construction. It provides great strength, low weight and wind resistance, and economy in the use of materials. Lattices of triangular cross-section are most common, and square lattices are also widely used. Guyed masts are often used; the supporting guy lines carry lateral forces such as wind loads, allowing the mast to be very narrow and simply constructed. When built as a tower, the structure may be parallel-sided or taper over part or all of its height. 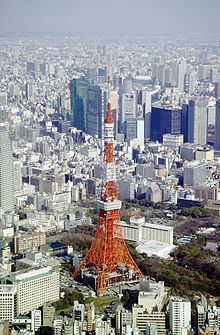 When constructed of several sections which taper exponentially with height, in the manner of the Eiffel Tower, the tower is said to be an Eiffelized one. The Crystal Palace tower in London is an example. Guyed masts are sometimes also constructed out of steel tubes. 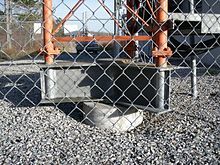 This construction type has the advantage that cables and other components can be protected from weather inside the tube and consequently the structure may look cleaner. These masts are mainly used for FM-/TV-broadcasting, but sometimes also as mast radiator. The big mast of Mühlacker transmitting station is a good example of this. A disadvantage of this mast type is that it is much more affected by winds than masts with open bodies. Several tubular guyed masts have collapsed. In the UK, the Emley Moor and Waltham TV stations masts collapsed in the 1960s. In Germany the Bielstein transmitter collapsed in 1985. Tubular masts were not built in all countries. In Germany, France, UK, Czech Republic, Slovakia, Japan and the Soviet Union, many tubular guyed masts were built, while there are nearly none in Poland or North America. In several cities in Russia and Ukraine several tubular guyed masts with crossbars running from the mast structure to the guys were built in the 1960s. All these masts, which are designed as 30107 KM, are exclusively used for FM and TV transmission and, except for the mast in Vinnytsia, are between 150–200-metre (490–660 ft) tall. The crossbars of these masts are equipped with a gangway that holds smaller antennas, though their main purpose is oscillation damping. TV Tower in Stuttgart, Germany: the first reinforced-concrete TV tower. Reinforced concrete towers are relatively expensive to build but provide a high degree of mechanical rigidity in strong winds. This can be important when antennas with narrow beamwidths are used, such as those used for microwave point-to-point links, and when the structure is to be occupied by people. In the 1950s, AT&T built numerous concrete towers, more resembling silos than towers, for its first transcontinental microwave route. In Germany and the Netherlands most towers constructed for point-to-point microwave links are built of reinforced concrete, while in the UK most are lattice towers. Concrete towers can form prestigious landmarks, such as the CN Tower in Toronto, Canada. In addition to accommodating technical staff, these buildings may have public areas such as observation decks or restaurants. The Stuttgart TV tower was the first tower in the world to be built in reinforced concrete. It was designed in 1956 by the local civil engineer Fritz Leonhardt. Kamzík TV Tower, overlooking Bratislava, Slovakia. Fiberglass poles are occasionally used for low-power non-directional beacons or medium-wave broadcast transmitters. Carbon fibre monopoles and towers have traditionally been too expensive but recent developments in the way the carbon fibre tow is spun have resulted in solutions that offer strengths similar or exceeding steel for a fraction of the weight which has allowed monopoles and towers to be built in locations that were too expensive or difficult to access with the heavy lifting equipment that is needed for a steel structure. Wood has been superseded in use by metal and composites for tower construction. Many wood towers were built in the UK during World War II because of a shortage of steel. In Germany before World War II wooden towers were used at nearly all medium-wave transmission sites which have all been demolished, except for the Gliwice Radio Tower. Ferryside television relay station is an example of a TV relay transmitter using a wooden pole. Shorter masts may consist of a self-supporting or guyed wooden pole, similar to a telegraph pole. Sometimes self-supporting tubular galvanized steel poles are used: these may be termed monopoles. In some cases, it is possible to install transmitting antennas on the roofs of tall buildings. In North America, for instance, there are transmitting antennas on the Empire State Building, the Willis Tower, 4 Times Square, and One World Trade Center. The North Tower of the original World Trade Center also had a 110-metre (360 ft) telecommunications antenna atop its roof, constructed in 1978–1979, and began transmission in 1980. When the buildings collapsed, several local TV and radio stations were knocked off the air until backup transmitters could be put into service. Such facilities also exist in Europe, particularly for portable radio services and low-power FM radio stations. In London, the BBC erected in 1936 a mast for broadcasting early television on one of the towers of a Victorian building, the Alexandra Palace. It is still in use. 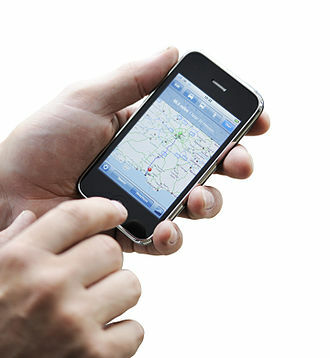 Many people view bare cellphone towers as ugly and an intrusion into their neighbourhoods. Even though people increasingly depend upon cellular communications, they are opposed to the bare towers spoiling otherwise scenic views. Many companies offer to 'hide' cellphone towers in, or as, trees, church towers, flag poles, water tanks and other features. There are many providers that offer these services as part of the normal tower installation and maintenance service. These are generally called "stealth towers" or "stealth installations", or simply concealed cell sites. The level of detail and realism achieved by disguised cellphone towers is remarkably high; for example, such towers disguised as trees are nearly indistinguishable from the real thing, even for local wildlife (who additionally benefit from the artificial flora). Such towers can be placed unobtrusively in national parks and other such protected places, such as towers disguised as cacti in United States' Coronado National Forest. Disguised cell sites sometimes can be introduced into environments that require a low-impact visual outcome, by being made to look like trees, chimneys or other common structures. A mast radiator is a radio tower or mast in which the whole structure works as an antenna. It is used frequently as a transmitting antenna for long or medium wave broadcasting. Structurally, the only difference is that a mast radiator may be supported on an insulator at its base. In the case of a tower, there will be one insulator supporting each leg. A special form of the radio tower is the telescopic mast. These can be erected very quickly. Telescopic masts are used predominantly in setting up temporary radio links for reporting on major news events, and for temporary communications in emergencies. They are also used in tactical military networks. 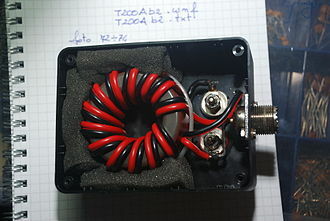 They can save money by needing to withstand high winds only when raised, and as such are widely used in amateur radio. Pump-up masts are often used on vehicles, and are raised to their full height pneumatically or hydraulically. They are usually only strong enough to support fairly small antennas. Telescopic lattice masts are raised by means of a winch, which may be powered by hand or an electric motor. These tend to cater for greater heights and loads than the pump-up type. When retracted, the whole assembly can sometimes be lowered to a horizontal position by means of a second tiltover winch. This enables antennas to be fitted and adjusted at ground level before winching the mast up. A tethered balloon or a kite can serve as a temporary support. It can carry an antenna or a wire (for VLF, LW or MW) up to an appropriate height. Such an arrangement is used occasionally by military agencies or radio amateurs. The American broadcasters TV Martí broadcast a television program to Cuba by means of such a balloon. In 2013, interest began in using unmanned aerial vehicles (drones) for telecom purposes. For two VLF transmitters wire antennas spun across deep valleys are used. The wires are supported by small masts or towers or rock anchors. The same technique was also used at Criggion radio station. For ELF transmitters ground dipole antennas are used. Such structures require no tall masts. They consist of two electrodes buried deep in the ground at least a few dozen kilometres apart. From the transmitter building to the electrodes, overhead feeder lines run. These lines look like power lines of the 10 kV level, and are installed on similar pylons. The cost of a mast or tower is roughly proportional to the square of its height. A guyed mast is cheaper to build than a self-supporting tower of equal height. A guyed mast needs additional land to accommodate the guys, and is thus best suited to rural locations where land is relatively cheap. An unguyed tower will fit into a much smaller plot. A steel lattice tower is cheaper to build than a concrete tower of equal height. Two small towers may be less intrusive, visually, than one big one, especially if they look identical. Towers look less ugly if they and the antennas mounted on them appear symmetrical. Concrete towers can be built with aesthetic design, especially in Continental Europe. They are sometimes built in prominent places and include observation decks or restaurants. For transmissions in the shortwave range, there is little to be gained by raising the antenna more than a few wavelengths above ground level. 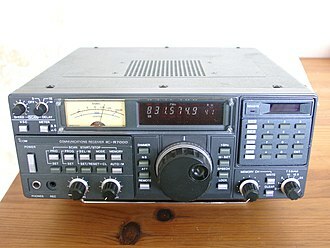 Shortwave transmitters rarely use masts taller than about 100 metres. Because masts, towers and the antennas mounted on them require maintenance, access to the whole of the structure is necessary. Small structures are typically accessed with a ladder. Larger structures, which tend to require more frequent maintenance, may have stairs and sometimes a lift, also called a service elevator. Tall structures in excess of certain legislated heights are often equipped with aircraft warning lamps, usually red, to warn pilots of the structure's existence. In the past, ruggedized and under-run filament lamps were used to maximize the bulb life. Alternatively, neon lamps were used. Nowadays such lamps tend to use LED arrays. Height requirements vary across states and countries, and may include additional rules such as requiring a white flashing strobe in the daytime and pulsating red fixtures at night. Structures over a certain height may also be required to be painted with contrasting color schemes such as white and orange or white and red to make them more visible against the sky. In some countries where light pollution is a concern, tower heights may be restricted so as to reduce or eliminate the need for aircraft warning lights. For example, in the United States the 1996 Telecommunications Act allows local jurisdictions to set maximum heights for towers, such as limiting tower height to below 200 feet (61 m) and therefore not requiring aircraft illumination under US Federal Communications Commission (FCC) rules. One problem with radio masts is the danger of wind-induced oscillations. This is particularly a concern with steel tube construction. One can reduce this by building cylindrical shock-mounts into the construction. One finds such shock-mounts, which look like cylinders thicker than the mast, for example, at the radio masts of DHO38 in Saterland. There are also constructions, which consist of a free-standing tower, usually from reinforced concrete, onto which a guyed radio mast is installed. One example is the Gerbrandy Tower in Lopik, Netherlands. Further towers of this building method can be found near Smilde, Netherlands and the Fernsehturm in Waldenburg, Germany. Radio, television and cell towers have been documented to pose a hazard to birds. Reports have been issued documenting known bird fatalities and calling for research to find ways to minimize the hazard that communications towers can pose to birds. There have also been instances of rare birds nesting in cell towers and thereby preventing repair work due to legislation intended to protect them. ^ "Some New York City TV and Radio Stations Off The Air After World Trade Center Collapse". Archived from the original on 2006-12-31. ^ "Telecom-equipped drones could revolutionize wireless market". azcentral.com. ^ Shire, Gavin G.; Karen Brown; Gerald Winegrad (June 2000). "Communication Towers: A Deadly Hazard to Birds" (PDF). American Bird Conservancy. Earthjustice. Retrieved 2010-09-29. ^ "Avian Collisions at Communication Towers - Sources of Information". U.S. Fish and Wildlife Service. June 1, 2009. Retrieved 2010-08-13. ^ Ray, Bill (17 April 2013). "Angry Birds fire back: Vulture cousins menace UK city's mobiles". The Register. Retrieved 20 May 2013. Wikimedia Commons has media related to Communications towers. All US Towers over 200 feet, transmitting on certain frequencies, or have certain transmitters over a certain power, must be registered in the US. This is the online directory. Mike Fitzpatrick's NECRAT.US tower based website contains tower pictures from New England, New York, and beyond. ITU, based in Geneva, Switzerland, is a member of the United Nations Development Group. ITU has been an intergovernmental public-private partnership organization since its inception, ITU was formed in 1865, in Paris, at the International Telegraph Convention, this makes it one of the oldest intergovernmental organizations in the world. ITU became a United Nations specialized agency in 1947, the ITU comprises three sectors, each managing a different aspect of the matters handled by the Union, as well as ITU Telecom. The sectors were created during the restructuring of ITU at its 1992 Plenipotentiary Conference, radiocommunication Established in 1927 as the International Radio Consultative Committee or CCIR, this sector manages the international radio-frequency spectrum and satellite orbit resources. In 1992, the CCIR became the ITU-R, Standardization Standardization was the original purpose of ITU since its inception. Established in 1956 as the International Telephone and Telegraph Consultative Committee or CCITT, in 1993, the CCITT became the ITU-T.
Development Established in 1992, this sector helps spread equitable and affordable access to information and communication technologies, ITU Telecom ITU Telecom organizes major events for the worlds ICT community. A permanent General Secretariat, headed by the Secretary General, manages the work of the Union. The basic texts of the ITU are adopted by the ITU Plenipotentiary Conference, the ITU is headed by a Secretary-General, who is elected to a four-year term by the member states at the ITU Plenipotentiary Conference. On 23 October 2014 Houlin Zhao was elected 19th Secretary-General of the ITU at the Plenipotentiary Conference in Busan and his four-year mandate started on 1 January 2015, and he was formally inaugurated on 15 January 2015. There are 193 Member States of the ITU, which are all UN member states, the most recent member state to join the ITU is South Sudan, which became a member on 14 July 2011. The Republic of China was blocked from membership by the Peoples Republic of China, palestine was admitted as an observer in 2010. A satellite dish is a dish-shaped type of parabolic antenna designed to receive electromagnetic signals from satellites, which transmit data transmissions or broadcasts, such as satellite television. The parabolic shape of a dish reflects the signal to the focal point. 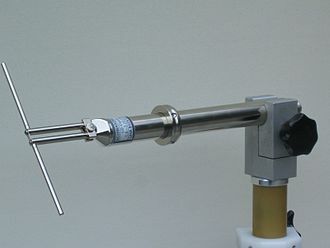 Mounted on brackets at the focal point is a device called a feedhorn. This feedhorn is essentially the front-end of a waveguide that gathers the signals at or near the focal point, the LNB converts the signals from electromagnetic or radio waves to electrical signals and shifts the signals from the downlinked C-band and/or Ku-band to the L-band range. 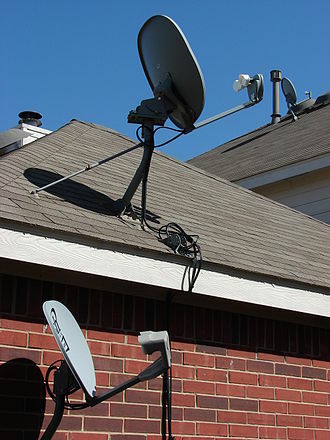 Direct broadcast satellite dishes use an LNBF, which integrates the feedhorn with the LNB, the theoretical gain of a dish increases as the frequency increases. The actual gain depends on factors including surface finish, accuracy of shape. A typical value for a consumer type 60 cm satellite dish at 11.75 GHz is 37.50 dB, with lower frequencies, C-band for example, dish designers have a wider choice of materials. 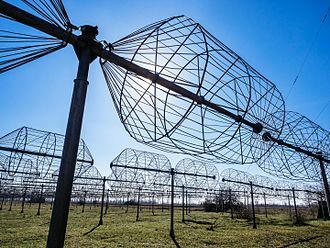 The large size of dish required for lower frequencies led to the dishes being constructed from metal mesh on a metal framework, at higher frequencies, mesh type designs are rarer though some designs have used a solid dish with perforations. A common misconception is that the LNBF, the device at the front of the dish, modern dishes intended for home television use are generally 43 cm to 80 cm in diameter, and are fixed in one position, for Ku-band reception from one orbital position. Prior to the existence of direct broadcast satellite services, home users would generally have a motorised C-band dish of up to 3 m in diameter for reception of channels from different satellites. Overly small dishes can still cause problems, including rain fade, in Europe, the frequencies used by DBS services are 10. 7–12.75 GHz on two polarisations H and V. This range is divided into a low band with 10. 7–11.7 GHz, and this results in two frequency bands, each with a bandwidth of about 1 GHz, each with two possible polarizations. Coaxial cable, or coax, is a type of cable that has an inner conductor surrounded by a tubular insulating layer, surrounded by a tubular conducting shield. Many coaxial cables have an outer sheath or jacket. The term coaxial comes from the conductor and the outer shield sharing a geometric axis. Coaxial cable was invented by English engineer and mathematician Oliver Heaviside, Coaxial cable is used as a transmission line for radio frequency signals. Its applications include feedlines connecting radio transmitters and receivers with their antennas, computer network connections, digital audio and this allows coaxial cable runs to be installed next to metal objects such as gutters without the power losses that occur in other types of transmission lines. Coaxial cable provides protection of the signal from external electromagnetic interference, the cable is protected by an outer insulating jacket. Normally, the shield is kept at ground potential and a signal carrying voltage is applied to the center conductor, the advantage of coaxial design is that electric and magnetic fields are restricted to the dielectric with little leakage outside the shield. Conversely and magnetic fields outside the cable are largely kept from interfering with signals inside the cable, larger diameter cables and cables with multiple shields have less leakage. Common applications of coaxial cable include video and CATV distribution, RF and microwave transmission, the characteristic impedance of the cable is determined by the dielectric constant of the inner insulator and the radii of the inner and outer conductors. A controlled cable characteristic impedance is important because the source and load impedance should be matched to ensure maximum power transfer, other important properties of coaxial cable include attenuation as a function of frequency, voltage handling capability, and shield quality. Coaxial cable design choices affect physical size, frequency performance, power handling capabilities, strength, the inner conductor might be solid or stranded, stranded is more flexible. To get better performance, the inner conductor may be silver-plated. Copper-plated steel wire is used as an inner conductor for cable used in the cable TV industry. A focal cloud is the collection of focal points of an imperfect lens or parabolic reflector whether optical, electrostatic or electromagnetic. This includes parabolic antennas and lens-type reflective antennas of all kinds, the effect is analogous to the circle of confusion in photography. In a perfect lens or parabolic reflector, rays parallel to the devices axis striking the lens or reflector all pass through a single point, the focal point. In an imperfectly constructed lens or reflector, rays passing through different parts of the element do not converge to a point but have different focal points. The set of these focal points forms a region called the focal cloud, the diameter of the focal cloud determines the maximum resolution of the optical system. Lens-reflector artifacts and other imperfections determine the diameter of the focal cloud. A focal cloud can render a satellite dish rather inefficient in relation to its size in specific frequencies, for countering the effect, there are several techniques, either in construction of the reflectors or lenses, or in the way signal beams are concentrated. In radio and electronics, an antenna, or aerial, is an electrical device which converts electric power into radio waves, and vice versa. It is usually used with a transmitter or radio receiver. In reception, an antenna intercepts some of the power of a wave in order to produce a tiny voltage at its terminals. Antennas are essential components of all equipment that uses radio, typically an antenna consists of an arrangement of metallic conductors, electrically connected to the receiver or transmitter. These time-varying fields radiate away from the antenna into space as a transverse electromagnetic field wave. Antennas can be designed to transmit and receive radio waves in all directions equally. The first antennas were built in 1888 by German physicist Heinrich Hertz in his experiments to prove the existence of electromagnetic waves predicted by the theory of James Clerk Maxwell. Hertz placed dipole antennas at the point of parabolic reflectors for both transmitting and receiving. He published his work in Annalen der Physik und Chemie, the words antenna and aerial are used interchangeably. Occasionally the term aerial is used to mean a wire antenna, note the important international technical journal, the IEEE Transactions on Antennas and Propagation. In the United Kingdom and other areas where British English is used, the origin of the word antenna relative to wireless apparatus is attributed to Italian radio pioneer Guglielmo Marconi. In the summer of 1895, Marconi began testing his wireless system outdoors on his fathers estate near Bologna, Marconi discovered that by raising the aerial wire above the ground and connecting the other side of his transmitter to ground, the transmission range was increased. Soon he was able to transmit signals over a hill, a distance of approximately 2.4 kilometres, in Italian a tent pole is known as lantenna centrale, and the pole with the wire was simply called lantenna. Until wireless radiating transmitting and receiving elements were simply as aerials or terminals. Because of his prominence, Marconis use of the word spread among wireless researchers. 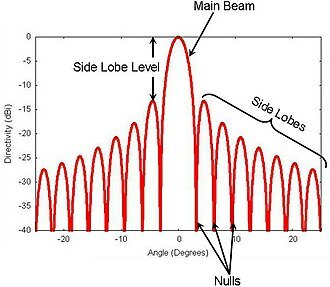 In antenna engineering, side lobes or sidelobes are the lobes of the far field radiation pattern that are not the main lobe. In a directional antenna in which the objective is to emit the radio waves in one direction, the lobe in that direction has a field strength than the others. The other lobes are called lobes, and usually represent unwanted radiation in undesired directions. The side lobe in the direction from the main lobe is called the back lobe. In transmitting antennas, excessive side lobe radiation wastes energy and may cause interference to other equipment, classified information may be picked up by unintended receivers. In receiving antennas, side lobes may pick up interfering signals, the power density in the side lobes is generally much less than that in the main beam. It is generally desirable to minimize the level, which is measured in decibels relative to the peak of the main beam. The main lobe and side lobes occur for both conditions of transmit, and for receive. For a rectangular aperture antenna having a uniform distribution, the first sidelobe is -13.26 dB relative to the peak of the main beam.57 dB relative to the peak of the main beam. 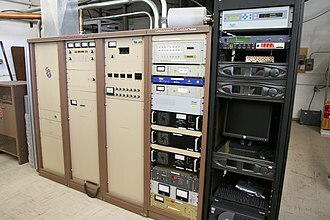 In radio communications, a radio receiver is an electronic device that receives radio waves and converts the information carried by them to a usable form. It is used with an antenna, the antenna intercepts radio waves and converts them to tiny alternating currents which are applied to the receiver, and the receiver extracts the desired information. The information produced by the receiver may be in the form of sound, a radio receiver may be a separate piece of electronic equipment, or an electronic circuit within another device. The most familiar form of radio receiver is a broadcast receiver, often just called a radio, the sound is produced either by a loudspeaker in the radio or an earphone which plugs into a jack on the radio. The radio requires electric power, provided either by batteries inside the radio or a cord which plugs into an electric outlet. 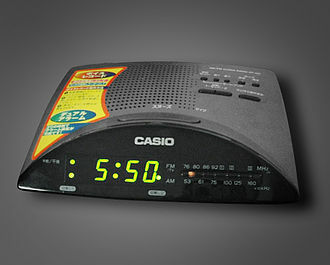 All radios have a control to adjust the loudness of the audio. The frequency of radio stations is usually listed prominently in their advertising, in order to select a particular station to receive, the radio is adjusted to the frequency of the desired transmitter. In some radios this is done by the user turning a tuning knob until the station is heard in the radios loudspeaker. In most countries radio broadcasting is permitted using two different methods of modulation, that is, methods of adding the signal to the radio wave, AM and FM. In amplitude modulation the strength of the signal is varied by the audio signal. AM broadcasting is permitted on AM broadcast bands between 148 and 283 kHz in the low range and 526 and 1706 kHz in the medium frequency range of the radio spectrum. In frequency modulation the frequency of the signal is varied slightly by the audio signal. FM broadcasting is permitted in the FM broadcast bands between about 65 and 108 MHz in the high frequency range. The exact frequency ranges vary somewhat in different countries, radios sold in each receive the correct frequency range for that country. Most broadcast radios, called AM/FM radios, can receive both AM and FM bands, and have a switch to select which band to receive. 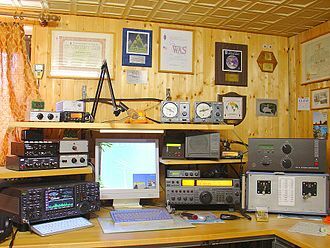 Limited AM broadcasting is permitted in parts of the high frequency band called the shortwave band. The feed for this Yagi-Uda television antenna is the driven element (doubled rod) and the feedline attached to it.